Compensatory angiogenesis mediated by galectin-1/glycan interactions. This scenario leads to Gal1-induced revascularization thatpromotes tumor progression. In contrast, sensitive tumors are not able to induce these changes glycosilationpatterns (lower panels) and cannot overcome the vessels pruning induced by anti-VEGF treatment. In tumors that are resistant to anti-vascular endothelial growth factor (VEGF) treatment (upper panels) hypoxia induces tumor cells to secrete Gal1 and reprograms the endothelial cell glycome, an effect that facilitates exposure of Gal1-binding sites. This scenario leads to Gal1-induced revascularization and tumor progression. 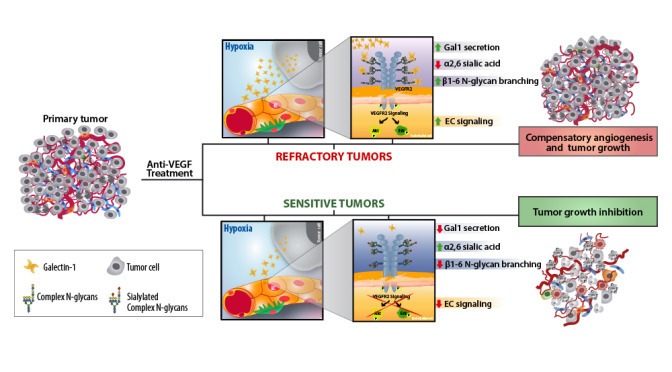 In contrast, anti-VEGF sensitive tumors are covered by α2,6-linked sialic acid which prevents Gal1 binding and tumor angiogenesis. (lower panels). Croci et al, OncoImmunology, 2014.